Pathogenic gain-of-function mutations in the gene encoding phosphoinositide 3-kinase delta (PI3Kδ) cause activated PI3Kδ syndrome (APDS), a disease characterized by humoral immunodeficiency, lymphadenopathy, and an inability to control persistent viral infections including Epstein-Barr virus (EBV) and cytomegalovirus (CMV) infections. Understanding the mechanisms leading to impaired immune response is important to optimally treat APDS patients. Immunosenescence of CD8+ T cells was suggested to contribute to APDS pathogenesis. However, the constitutive activation of T cells in APDS may also result in T cell exhaustion. 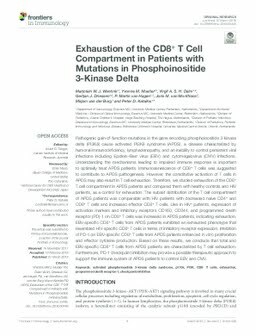 Therefore, we studied exhaustion of the CD8+ T cell compartment in APDS patients and compared them with healthy controls and HIV patients, as a control for exhaustion. The subset distribution of the T cell compartment of APDS patients was comparable with HIV patients with decreased naive CD4+ and CD8+ T cells and increased effector CD8+ T cells. Like in HIV+ patients, expression of activation markers and inhibitory receptors CD160, CD244, and programmed death receptor (PD)-1 on CD8+ T cells was increased in APDS patients, indicating exhaustion. EBV-specific CD8+ T cells from APDS patients exhibited an exhausted phenotype that resembled HIV-specific CD8+ T cells in terms of inhibitory receptor expression. Inhibition of PD-1 on EBV-specific CD8+ T cells from APDS patients enhanced in vitro proliferation and effector cytokine production. Based on these results, we conclude that total and EBV-specific CD8+ T cells from APDS patients are characterized by T cell exhaustion. Furthermore, PD-1 checkpoint inhibition may provide a possible therapeutic approach to support the immune system of APDS patients to control EBV and CMV.